We all love pasta at home and would happily eat it two or three times a week. It’s quick and easy to put together a tasty dish, and it’s always a hit with my children. My four are big fans of pesto pasta, so I’m pretty sure they will be keen on my friend Mandy’s Vegan Rocket Pesto with Tagliatelle. Mandy and I spent a long weekend with friends in France a couple of months ago, relaxing, practising pilates and eating a lot of moreish yet healthy food. It was heaven! Mandy has been sharing kids’ recipes on ‘Sneaky Veg‘ for years (check those cute Veggie Halloween Mummy Sausages) and she also writes ‘Cook Veggielicious,’ a fab vegan recipe resource where you can find recipes like Mandy’s Vegan Christmas Cake or even round-ups of fab recipes like this selection of 20 vegan pasta recipes. My name is Mandy Mazliah and I’m a mum of three from South London. I’ve been blogging over at Sneaky Veg since 2013 sharing fruit and veg recipes for kids. I went vegan in January 2018 and started a new blog, Cook Veggielicious. When I’m not blogging I love a good book, yoga and I’m trying my best to run regularly too. What kind of recipes do you cook most? I cook a lot of international food. I find a lot of inspiration for vegan recipes in Asian, African and middle eastern cooking. On a typical week I’ll make a noodle dish, a stir fry, a curry and a pasta dish. We almost always have homemade pizza on a Wednesday too. I get the kids involved in rolling out the dough and putting on their toppings and they love it. Is there any food you wouldn’t try unless your life depended on it? My father-in-law is from Argentina and over there you often get a plate of BBQd meat called a parillada which includes internal organs and intestines. The intestines look particularly disgusting and I just can’t imagine that I’d be able to eat them without gagging! Can you share a fond memory about food? I had to think about this one for ages – I have so many! Arriving in India in 2008 halfway through a year’s backpacking and being able to eat incredible vegetarian food everywhere I went after six months in south America (I ate a lot of omelettes) was a wonderful feeling. But a more recent fond memory was just the other day when I made pea and mint risotto and turned some of it into arancini. My eight year old (an extremely picky eater and the inspiration behind Sneaky Veg) tucked in, declared them delicious and even ate all the peas. If you have a picky child you’ll understand the joy this caused me. What is your favourite way to share your recipes? I really love Instagram. I have “met” a lovely community of people, mostly mums sharing food, through Instagram and I’ve even met some of them in real life. Could you share a couple of tips that make your life easier when you’re cooking? This might sound silly but if you’re following a recipe read the whole thing to the end before you start. Sometimes things take longer than you expect! And getting all your chopping and prep ready beforehand will also help you out. I’m actually terrible at doing that but when I do manage it things always go smoother! With no further ado, here is Mandy’s Vegan Rocket Pesto with Tagliatelle. Cook the tagliatelle following the packet instructions. Place the remaining ingredients in a blender or food processor and pulse until broken down. 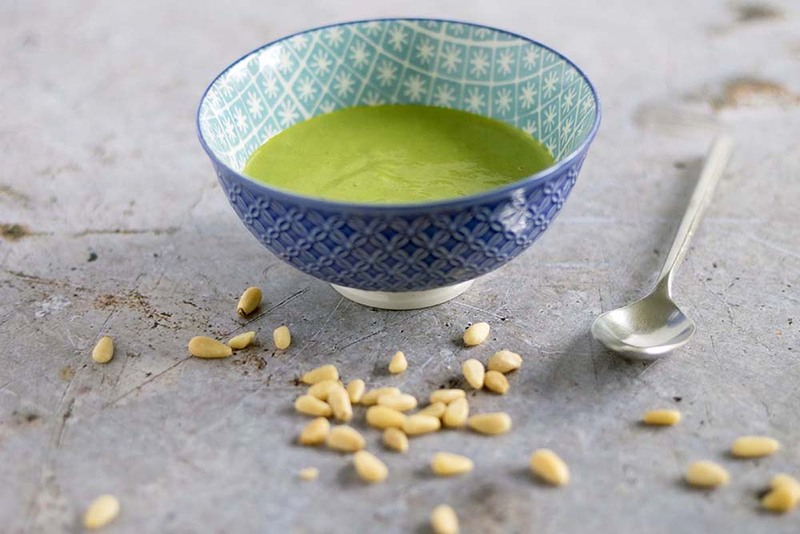 If using, lightly toast the extra pine nuts in a dry frying pan for a couple of minutes. Stir and take care they don’t burn. Drain the pasta when cooked and stir through the rocket pesto. Sprinkle over the toasted pine nuts and serve immediately. Thank you so much for sharing, Mandy! I really love how quickly you can get this meal together. Perfect mid-week dinner! I don’t think I’d be keen on parillada either! In France, offalls are quite popular too but they were never my cup of tea. I can imagine how happy you must have been to arrive in India and have lots more veggie food after six whole months in South America! Fancy seeing your recipe on Feature my Food Fridays? Whether you are a keen baker, a blogger or a reader who would like to see their creation online, I would love to feature you! Just email me and I will send you more details. Such a great recipe there- so easy and quick to prepare but I’m sure it tastes divine! Thank you for sharing. There’s nothing like an easy peasy recipe ready in less than 10 minutes mid-week, is there? 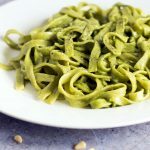 We love a delicious tagliatelle dish in our house and this looks amazing – I love pesto a lot and love that this is so quick and easy. Pasta really is my 1st choice when it comes to busy evenings and I love the fact Mandy’s recipe only takes minutes! I adore pesto pasta dishes, and this has my mouth watering. Also, Sneaky Veg is one of my favourite blogs, love to learn a bit more about Mandy! 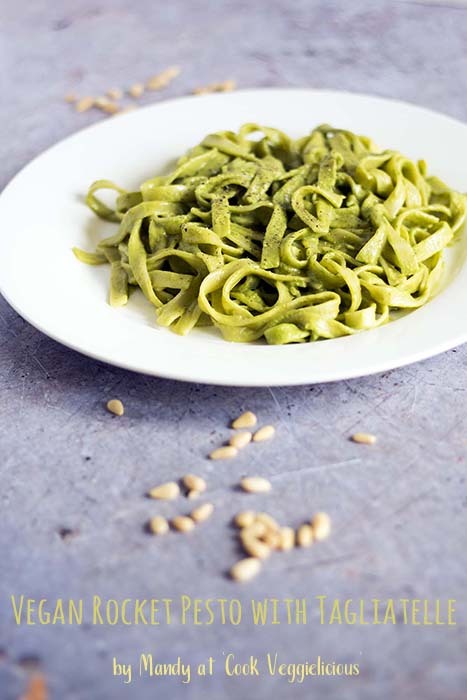 I love pesto so much – what a great pasta recipe! I’m a pretty adventurous eater and had intestines the first time a couple years ago. I wasn’t sure I’d like it, but I actually LOVE it! 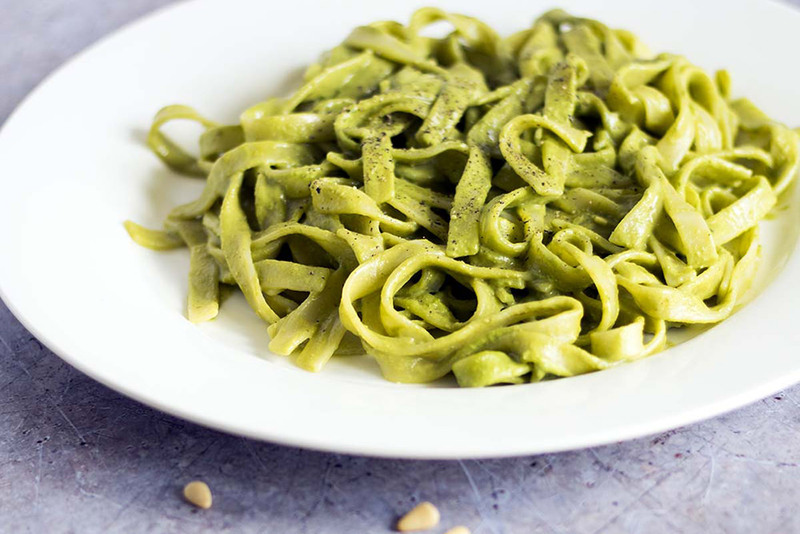 This vegan rocket pesto pasta looks so tasty. Love that it only has a few ingredients and not many steps, perfect for a quick weeknight meal.